Buy online ESP8266 -12E Wi-Fi Wireless Transceiver Module in India at low cost from DNA Technology, Nashik. 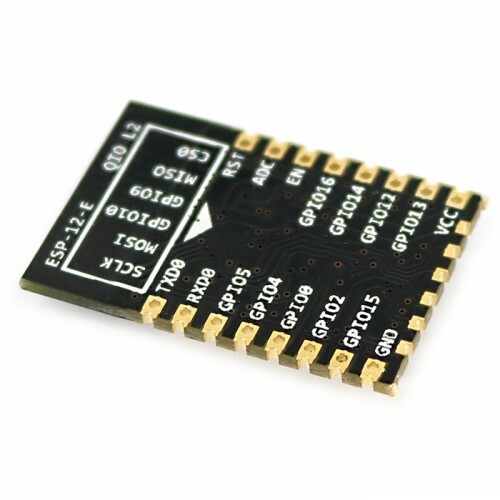 ESP-12E is an enhanced version ESP8266-12, improve the external circuit, enhanced impedance signal output is better, whether it is stable or anti-jamming capability, have been greatly improved ! Before selecting a user for ESP-12 's, it does not matter even if the product has been made , enhanced version is fully compatible with previous firmware pin has added the ESP-12 on the basis of six IO ports , SPI mouth leads , develop more convenient, application more extensive. It can be used for remote monitoring of home appliances, bedroom temperature and humidity, and controlling home appliances by the mobile phone. IO Port Package: Both SMD and Inline package are available, and the pin pitch is 2.0mm. ESP-07 Wi-Fi Wireless Transceiver ModuleThis is a WiFi serial transceiver module, based on ESP8266 S..